Q: Is a heating & air conditioning system with more capacity always better? A: No. A larger system with more capacity actually delivers less comfort and costs more to operate. An air conditioner is at its least efficient when it’s first turned on. A system with too much capacity will run in numerous short cycles, turning on and off repeatedly, therefore causing it to be less efficient. Also, keep in mind that an air conditioner only removes humidity when it’s running, so a system with shorter run cycles doesn’t remove humidity from the air very well. Contact a qualified professional when replacing your heating & air conditioning system. A qualified professional technician will have the experience to ensure you have a system that best matches the capacity of your home. Q: What are some examples of contributors to poor indoor air quality? A: Many factors can cause poor air quality in your home. Some common contributors are listed below. Although you may not have all of these occurring in your home, by addressing the ones you do, you can increase your air quality and overall home comfort. 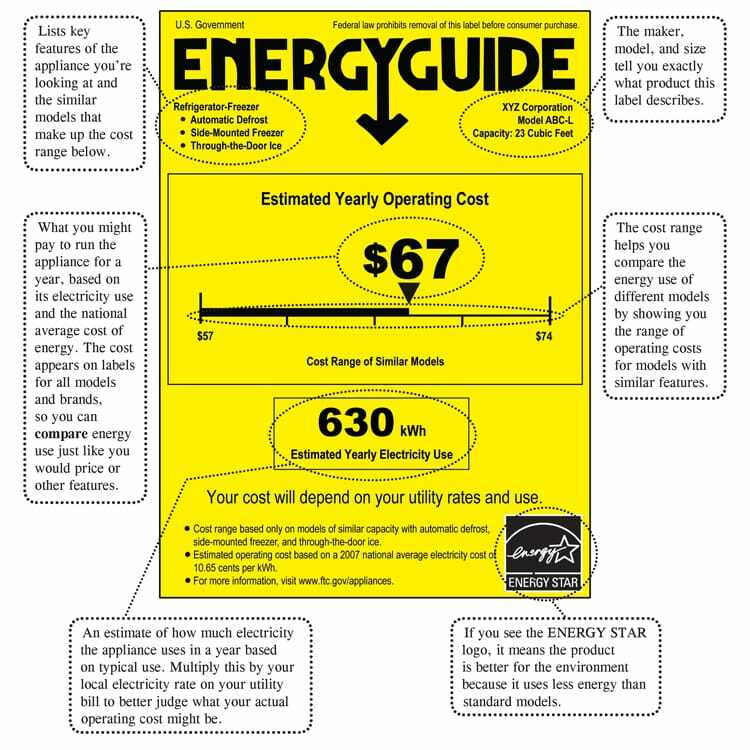 Q: How important is an EnergyGuide Label? A: The EnergyGuide label is important when shopping for an energy-efficient product. The U.S. government requires manufacturer’s to affix the label to a variety of products to provide a way for consumers to compare the energy use of similar appliances. The EnergyGuide label makes it easier to find energy efficient appliances, which cost less to run, and help lower your utility bills. And of course, using less energy is good for the environment, too; it can reduce air pollution and help conserve our natural resources. Q: What are some signs that might indicate I have a problem with my HVAC system? A: While not always, you may notice an abnormal noise coming from the system, your heating or cooling system running non-stop, or warm air/cool air coming from the vents during the opposite season. Abnormally high utility bills are also a common indicator. Q: Can I save money by closing off HVAC vents in rooms I don’t use a lot? A: The practice of closing off vents in parts of your home that aren’t being used in order to save money dates back to when homes were heated from a central location, like a fireplace. Back then it worked. Today homes are equipped with central heating and air conditioning systems, by closing off the parts of your home and shutting vents in those areas, you can actually increase your energy costs, not reduce then. The reason is simple; a modern home’s HVAC system is designed to either heat or cool the entire residence, and is sized according to this need. By shutting off a part of the air flow, you increase the air press on the system, which can increase the amount of leakage from the ductwork. In fact, too many vents closed can actually cause your HVAC system to malfunction. This is because today’s systems rely on a certain amount of air flow to maintain a certain temperature within them. Q: What should I know about efficiency when purchasing a new heating and/or cooling system? A: When purchasing an air conditioner, furnace or heat pump, always ask about its efficiency rating. This rating will tell you how efficiently the unit uses fuel (gas, electricity or oil). More efficient equals lower utility bills! AFUE (Annual Fuel Utilization Efficiency Ratio): A measurement of the percent of heat produced by a furnace for every dollar of fuel consumed -- The higher the AFUE rating, the lower the fuel costs. All furnaces manufactured today must meet at least 78%. Older furnaces (10-15 years or older) may fall below this minimum. Furnaces with AFUE rating from 78% to 80% are considered mid-efficiency; ones with AFUE ratings of above 90% are considered high-efficiency. Q: What are the benefits of air duct cleaning? A: NADCA’s (National Air Duct Cleaners Association) rule of thumb for consumers is that “if your ducts look dirty, they probably are,” and that dirty HVAC systems should be inspected by a reputable, certified HVAC professional. Through normal occupation in a home, a great deal of contaminants and air pollutants are generated, such as dander, dust, and chemicals. These contaminants are pulled into the HVAC system and re-circulated 5 to 7 times per day, on average. Over time, this re-circulation causes a build-up of contaminants in the duct work. While dirty ducts don’t necessarily mean unhealthy air in your home, they may be contributing to larger health issues or harboring contaminants that could cause serious problems for people with respiratory health conditions, autoimmune disorders or some environmental allergies. Indoor Air Quality. Indoor air quality is one concern that homeowners have when they decide to investigate air duct cleaning. In a typical six-room home, up to 40 pounds of dust is created annually through everyday living. Your heating and cooling system is the lungs of your home. The system taken air in and breathes air out. Energy Savings. According to the U.S. Department of Energy, 25 to 40 percent of the energy used for heating or cooling a home is wasted. Contaminants in the heating and cooling system cause it to work harder and shorten the life of your system. Although filters are used, the heating and cooling system still gets dirty through normal use. When an HVAC system is clean, it doesn’t have to work as hard to maintain the temperature you desire. As a result, less energy is used, leading to improved cost-effectiveness. Q: How often should I have my system serviced? A: You should have your heating system serviced once a year for a seasonal check-up in the fall. A heating system that is not maintained is a problem waiting to happen. At the very least, you will have escalating operating costs due to the inefficient running of your system and the eventual need for repairs. In the worst case, improperly maintained equipment powered by natural gas can compromise your safety by causing high levels of CO, resulting in serious injury or even death. Q: What can I do to help the allergy and asthma sufferers in my home? A: Suffering from allergies or asthma can have a negative effect on the quality of a person’s life. That is why this issue is another concern that our customers express when they call into our office. The dust & pollutants that are trapped in homes are troublesome for everyone but particularly for those who have allergies and asthma. We provide our customers with several options of air filtration systems to address these concerns. Our technicians can evaluate your particular situation and find the best solution for you and your family. Q: How is the efficiency of heating and air conditioning equipment measured? Q: What can I do if I have uneven temperatures throughout my home? A: Temperature differences of up to three degrees from room to room are not uncommon, but often one or several rooms are uncomfortably warm or cold. This condition could be caused by a number of factors within your home including inadequate insulation, air leakage, poor duct system design, duct leakage, unwanted heating by the sun in warmer months, or a failure in part of your heating and cooling system. Q: What are some things that can invalidate a manufacturer’s warranty? A: One major factor that voids many warranties is lack of maintenance. For instance, having your air conditioner (or furnace) maintained annually. If you don’t have documentation that your system has been maintained according to the manufacturer’s requirements, they may not cover any necessary repairs. Next, never order any parts from the internet. Only order parts and have them installed through a licensed dealer. Saving a few dollars on a part voids the entire warranty. Third, a proof of purchase may be required if your system needs any maintenance done under the warranty; keep it near the owner’s manual and warranty information so you can’t misplace it. Keep in mind, new systems must be installed by a licensed HVAC contractor. Any system or component not installed by licensed contractor will void the warranty for the entire system. It’s worth it to work with reputable companies when the investment numbers in the thousands of dollars. Last, if any heating and cooling equipment is moved from its original location in your home, the warranty will be voided. Never alter your system or use it for unintended purposes. Q: Am I eligible for tax credits on an energy-efficient HVAC system I purchased last year (2012)? A: Yes! The Energy Improvement and Extension Act of 2008, in conjunction with Internal Revenue Code Section 25C, allowed for tax credits for equipment of specific efficiency levels; it took effect on January 1, 2009 and was allowed to expire on December 31, 2011. Now, they’re extended both back to January 1, 2011 and forward to December 31, 2013. To learn more details about these beneficial tax credits and if you qualify, contact us. Q: What are the benefits of insulating ductwork and pipes? A: Insulating pipes and ducts that run through unheated space will result in a significant savings in your energy bill. Making sure conditioned air isn’t leaking out of your ductwork can save you on your utility bills and keep your system from running too hard. Heat escapes from bare hot-water pipes causing the water sitting in those pipes to cool down between uses. This results in running extra water from the faucet to get hot water. Wrapping these pipes will save you money. Wrapping cold water lines won't save you energy dollars, but can eliminate dripping and sweating from condensation, avoiding water spots. Q: What are some health benefits to using a whole-house humidifier in the winter? Q: I think I am spending way too much on heating and cooling my home. How can I find out for sure? A: Start with your utility company; they can help a great deal. How do you know how much is “too much”? Comparing previous bills isn’t always a good measure, as the weather is never exactly the same month to month. Instead, if you take your energy bill and divide it by the square footage of livable space in your home (e.g. don’t count areas like unfinished garages or basements) you can calculate how much you are spending to heat or cool each square foot of your home. Your energy provider can tell you what the average cost per square foot is in your region for that same period of time so you can compare apples to apples. Q: Why does my toilet keep flushing by itself? A: A toilet may flush itself when the Douglas valve seal becomes warped. When this seal is warped, the toilet tank continually leaks water into the bowl, triggering the fill sensors, indicating that the bowl is filled and needs to be flushed. It’s the same as when you fill the toilet with water and it flushes itself. Q: Is heating & air conditioning system maintenance really important? A: Absolutely. Proper maintenance can help your unit last for years longer. On the flip side, a neglected system loses roughly 5% of its efficiency each year that it operates without upkeep. So that “green” machine that you bought to stay cool (or warm) could start to function like the most inefficient thing on the market, if you fail to perform regular maintenance. Proper maintenance will increase the longevity of your system, ensure your family is comfortable, decrease the chances of breakdowns, and maintain the safe operation of your system. Q: What are some things I should look for in a good contractor? Q: What are some great low-cost and no-cost ways homeowners can reduce energy costs? A: First, replace your heating and cooling system’s air filters on a regular basis. This helps your system run more efficiently. Second, wrap your water heater in an insulation blanket. Third, install low-flow shower heads and water restrictors on your faucets. Fourth, use window treatments seasonally, closed during the summer to keep the heat out and open during the winter to use the sun’s rays to warm your home. Last, insulate…place weather striping around windows and door frames and draft guards beneath doors. A: A tankless water heater heats water directly without the use of a storage tank, making it more efficient by avoiding standby heat losses associated with storage water heaters. Tankless water heaters are also able to supply an endless supply of water, are 50% more energy efficient, and have about twice the life expectancy of traditional water heaters. Lastly, tankless water heaters are wall mountable and thereby do not take up the floor space. Contact us for more information. Q: What should I do if my air conditioner will not come on? A: First, check your circuit breakers for a tripped switch. Note: Changing the thermostat quickly can cause a disruption. Allow 15 minutes for the compressor to automatically reset itself. Next, make sure the blower compartment door is closed. The unit will not come on if the door is open. Lastly, shrubbery around the outside unit can also interfere with proper operation. Make sure there is 1-2 feet of air around the outside unit. If the air conditioner still does not engage, contact your HVAC technician. Q: Should I keep my air conditioning system from running too much? A: Generally speaking, a unit that is either on or off is less expensive than one that keeps cycling on and off repeatedly. Every time your system starts up, it will use a lot of electricity and not produce much cooling. That’s why a smaller system is often more economical to operate, even though it runs nonstop and may deliver less comfort, it will usually consume less power than a larger system that cycles on or off. Of course, it’s best to have your system sized to match the requirements of your home. Q: What are some things I can do to take care of my faucets and sinks? A: Even small drips can waste thousands of gallons of water, as much as 150 gallons a day. Be sure to check under sinks for moisture or small leaks. And always repair leaky faucets right away to avoid paying for wasted water, and also to avoid water damage to your fixtures and pipes and surrounding areas. Remove and clean your faucet aerators annually to ensure an even flow of water. Make sure overflow holes on tubs and vanities are clear and open to prevent water damage to floors and ceilings. Q: What’s the best way to get my air conditioning running in the spring? Remove the air filter on the furnace and clean it out. If you have a humidistat, turn it from 35% to 0%. 24 hours before starting your air conditioning, turn the disconnect back on. Wash the condenser unit (that's the unit outside your house). Set your hose nozzle for a fine spray of water and spray from the top down. Turn on your air conditioning and enjoy the cool comfort inside. If you haven’t already, be sure to schedule a tune-up for your air conditioning before the heat of the season is in full swing. Annual maintenance improves efficiency and increases safety, comfort and reliability. Q: Why does my water heater run out of water quicker than it used to? A: Over time storage tank water heaters accumulate sediment and lime deposits. If these deposits are not removed periodically they will displace space in the tank and decrease the amount of water that can enter the tank when it refills. It’s important to drain and refill your water heater once year. This will also help your water heater last longer, as mineral deposits can corrode the bottom of the tank if left alone. Q: Why should homeowners schedule annual maintenance inspection on their heating and cooling systems? A: One of the reasons to have annual maintenance inspections for your heating and cooling system is to ensure that it is performing at maximum efficiency, which directly affects your monthly utility bills. You also want to make sure your equipment is functioning correctly and catch any problems before they become major expenses. Regular maintenance will often pay for itself in lower repair costs. Lastly, you want to make sure that your heating and cooling system is functioning properly to avoid any safety problems that could endanger your home and family, i.e. loose electrical connections or holes in your system’s heat exchanger can cause a carbon monoxide leak. Q: Before calling for service on my furnace (or AC) is there anything I should check first? A: Check to be sure your furnace and/or air conditioner are plugged in. Check that the breakers, and disconnects are turned on, and lastly, check to be sure the thermostat is set correctly. Also, make note of any strange noises or smells and inform your HVAC technician upon arrival. Q: Should I close HVAC vents in rooms I don’t use a lot in order to save money? A: The practice of closing off vents in parts of your home that aren’t being used in order to save money dates back to when homes were heated from a central location, like a fireplace. Back then it worked. Today homes are equipped with central heating and air conditioning systems, by closing off the parts of your home and shutting vents in those areas, you can actually increase your energy costs, not reduce them. The reason is simple; a modern home’s HVAC system is designed to either heat or cool the entire residence, and is sized according to this need. By shutting off a part of the air flow, you increase the air press on the system, which can increase the amount of leakage from the ductwork. In fact, too many vents closed can actually cause your HVAC system to malfunction. This is because today’s systems rely on a certain amount of air flow to maintain a certain temperature within them. Q: What are Some Easy Ways to Lower My Water Bill? A: We’re all looking for ways to conserve resources in an effort to save money. One of the easiest ways to do this is cut back on water use. There are a few simple things you can do around your home. Aerators on sink faucets are a great first step, as well as low flow showerheads. A lower GPF (gallons per flush) toilet is another fantastic upgrade. Upgrading your hot water supply can also help to reduce wasted water, as newer tankless systems don’t require a standing supply of hot water at all times like traditional tank–style systems. Q: Should a thermostat be set to “auto” or “on”? A: The “auto” setting is preferred, as well as the most used and most efficient setting. In this setting, the fan will only operate when the temperature requires it. There are advantages, however, to using the “on” setting. In this setting, air is constantly filtered through your unit’s air filter, and constantly circulating air results in even temperatures throughout your home. Q: How do I know if I should repair or replace my current heating and/or air conditioning system? Efficiency. Even if you completely restore an aging unit (which is expensive to do! ), you will still only have the efficiency that it was rated for when it was manufactured, at best. In a lot of cases, installing a new heating system can pay for itself in energy savings within a relatively short period of time. Current condition. Take into account the quality of your current unit, number of breakdowns you’ve experienced, and how often your unit has been maintained. If you have not maintained your unit and breakdowns are frequent, replacement should be a serious consideration. In this situation, no matter what the skill of the installer or service technician, there is little that can be done except restore the unit. So when faced with the decision to repair or replace, consider these factors and make the decision that’s most beneficial to you! A: If your system is old and inefficient, or the repairs are starting to increase in cost and frequency, you'll probably want to consider replacement. Today systems are as much as 60% more efficient than those systems manufactured as little as ten years ago. The savings you'll realize in monthly utility costs can help lower your overall investment. In fact, if you plan on financing your purchase, the monthly savings on your utility bill should be considered when determining the actual monthly cost of replacing your system. This offsetting savings may even permit you to purchase a more efficient system. Q: Is There Anything I Can Do If My Air Conditioner Isn’t Cooling Well? A: There are some things you can troubleshoot before you call in the experts. First, check your electrical box. See if the breaker for your heating & cooling (HVAC) system has been tripped or a fuse blown. Next, check your thermostat. Make sure it is set on “Cool” with the fan switch set to “Auto” or “On”. Also, check your thermostat by setting the temperature 10 degrees below room temperature to make sure your system turns on. Last, be sure that the air filter has been changed prior to turning on the air conditioner and that all air vents are open and clear from obstruction. If none of these steps are able to fix your problem, you should call a professional air conditioning technician to access and fix the problem. Q: What causes your air conditioning unit to frost over? A: Air conditioners work by moving warm air over the cooling coil (also know as the evaporator coil). This process removes moisture from the air, which accumulates in the collector pan. This process is also key to maintaining a comfortable environment for your home in the summer. If the air moves too slowly over the evaporator coils or if the refrigerant in your system is low you run the risk of the coil developing frost and icing over. A frozen unit will not be able to cool your home properly. A frozen unit can be the result of low refrigerant or a dirty filter or coils. You can help avoid these problems by scheduling annual maintenance and changing or cleaning your air filter on a regular basis. During a maintenance check-up your technician will clean dirty coils and changing or cleaning your filter ensures proper airflow through your system. If your refrigerant is low, this could be an indication that you have a leak. Contact a professional technician to check for proper refrigerant levels and leaks. Q: How Is Sizing Determined for my Heating and Cooling Unit? Is the size important? Q: How Can I Get Rid of the Foul Smell in my Garbage Disposal? A: These odors are a result of food debris building up in your disposal. Over time spoiled food and bacteria accumulate. A great way to eliminate this smell is to use a lemon or orange. Cut the lemon or orange up into small sections and put it into your disposal, run for about 30 seconds. Next, try squirting a little liquid dish detergent into the disposer while it’s running. Last, run cold water for about 30 seconds to rinse everything down the drain. Another quick tip is to always run cold water when grinding items in your garbage disposal. Q: The heating and cooling system is not working well in several rooms in my home. What should I do? If you have rooms in your home that are too hot or too cold, contact a heating and cooling professional. He (or she) will be able to evaluate your home and identify the problem. Below are some good questions to ask the technician. 1. Is my home’s insulation adequate? 2. Are the air ducts well sealed? 3. Is air distribution adequate for my home? 4. Do I have areas of high humidity or moisture buildup in my home? 5. Is my heating and cooling system operating as it should? There are a variety of variables that can cause certain rooms to overheat and other to get too cold. It is important to contact a trained professional in these situations who can not only evaluate your problem but also offer solutions and make any necessary repairs. Q: How Often Should I Replace my Furnace Filter? A: In general, you should replace your disposable filters at least once a month. We recommend that you visually check filters and filtering equipment monthly. If filters look dirty, they need to be cleaned or replaced. If you have washable filters, they can be rinsed off. Replacing your filters on a regular basis ensures optimum efficiency and filtration for your system. Q: What Causes the White Residue on my Dishes? A: Having water spots on dishes is a common problem. Your dishwasher is most likely doing all that it can, but the problem isn’t the appliance. The problem is the water. Water spots are created from droplets of water that remain on the dishes and are “baked” to the dishes from the heated dry cycle. The mineral deposits in the water are left on the dish leaving a small white discoloration. Using a monthly dishwasher cleaner is a great way to keep the components of your dishwasher clean and working, but it can’t change the water in between uses. The two most common solutions are to get a water softener or to use a dishwasher rinse aid. Water softeners have a high initial cost, but they remove the hard minerals from your water and increase the longevity of your water-using appliances. The use of a rinse aid helps the water run off of your dishes like Rain-x does for your windshield eliminating spots, but the cost can add up after a lifetime of using them. Q: What are furnace ratings? A: Furnaces are rated by the Annual Fuel Utilization (AFUE) ratio, which is a percent of heat produced for every dollar of fuel consumed. Like the miles per gallon rating on your car, the higher the AFUE rating, the lower your fuel costs. All furnaces manufactured must meet at least 78 percent AFUE. AFUE tells you how much of your fuel is used to heat your home and how much fuel is wasted. Example: If your furnace has a rating of 80%, the furnace converts 80% of the fuel that you supply to heat and 20% is lost out of the chimney. Q: How Can I Improve My Indoor Air Quality? What Terms Do I Need to Know? MERV is the Minimum Efficiency Reporting Value. This is the rating based on efficiently of air filters to remove particle of various sizes at different airflow rates. MERV ratings range from 1 - 16 and measurements are in microns. Higher MERV ratings mean fewer dust particles and other airborne contaminants pass through the filter. Some of the common particles related to MERV ratings are pet dander, insecticide dust, smog, dust, viruses, wood, tobacco smoke, spores, bacteria and pollen. Q: What Causes the White Substance on My Faucet? What Can I Do About It? A: Mineral deposits cause this unsightly buildup. To remove them, pour a cup of vinegar into a plastic bag. Place the bag over the showerhead or faucets and hold it in place with a twist tie overnight. In the morning, remove the bag and gently scrub off the deposits with an old toothbrush. Q: How can I identify the reasons for high home energy costs? Various factors drive operating costs for your heating and cooling system. The local climate, your area's electric (or gas) rates, even how often doors and windows are opened and shut affect the costs to run your heating & cooling system. Know the factors, so you can save money on electric bills and maintenance. Of course, there are some factors you cannot control, like climate. For example, a central air conditioner will run a lot harder and get more use in Florida, than in the Northeast. But you can lower operating costs by better insulating your home, and by keeping windows and doors to the outside shut as much as possible. Also, look at household additions, such as ceiling fans that can better distribute heated or cooled air throughout your home. Ask your service technician for ideas! Q: Why is water backing up into my sink while I run the dishwasher? A: There is usually a connection between the dishwasher and the drain from the garbage disposal. Food left behind in the garbage disposal can clog that connection to the main drain and back water up into your sink. To prevent this, make sure that your disposal is free of food before running the dishwasher. Also make sure to run the garbage disposal with plenty of water before turning the dishwasher on. Q: How can I improve the ventilation in my home? Q: Why do I need to clean my filter regularly? A: Regular filter replacement helps your heating and cooling system operate at peak levels and improves indoor air quality. It is important to change filters regularly to ensure proper air flow and to keep your home free from dust, allergens and germs. Depending upon the type of filter you have, you may require monthly or less frequent (3-6 month) media filter changes. If you are unsure of what type of filter your system uses, contact your service technician. Q: Should I be concerned if my toilet is leaking? A: Absolutely. Not only is it annoying to listen to, but it’s also a waste of water and money. Leaky toilets can add up in your water bills. According to a Penn State Article, “10 Easy Ways You Can Conserve Energy” (October 27, 2009, Volume 56, No. 09), “A ‘running’ toilet can waste two gallons of water per minute. A silent leak in a toilet can waste up to 7,000 gallons of water per month”. Here is a good example; say you had a running toilet that was leaking 2 gallons of water a minute for two weeks; 2 gallons x 14 days x 24 hours x 60 minutes = 40,320 gallons of wasted water. At a cost of .002 cents a gallon, (average cost of a gallon of water in the U.S., this varies per state and you can look up what you actually pay on your water bill) you will have spent $80.64 on this leaky toilet in additional water costs in just two weeks time. If your toilet continues to run after you flush it, it indicates that some part of the internal mechanism is out of order or broken. Sometimes a little jiggling of the toilet handle solves the problem. Sometimes a simple part needs to be replaced. The worst-case scenario is that the entire mechanism needs to be replaced. No matter what the cause make sure to diagnose the problem and get it fixed. A: The most important part of HVAC maintenance is preserving unrestricted airflows. Dust, dirt, and debris are an HVAC system’s worst enemies. Whether it’s an indoor or outdoor unit, you must keep all filters clean and heat exchangers and coils free of restrictions. We recommend that your heating and cooling system be checked and serviced twice a year; ideally a spring and autumn tune-up. Also we recommend that you change your filter regularly, depending on the type of filter you have. This alone can eliminate many of the most common problem that need fixing and can significantly reduce the likelihood of a serious breakdown. Q: Should I close registers and doors to areas of my home I’m not using? A: No. Every system is designed to cool a certain number of square feet. By closing registers and doors in certain rooms, you disrupt and decrease the system’s airflow and efficiency. You system will have to work harder to cool less space, making it cycle more and become less efficient. Q: Besides changing my filters, what maintenance should I do on my HVAC? A: Most maintenance should be performed only by a qualified service technician, however, there are a few things you can do to ensure optimal performance. Keep ground mounted outdoor units clear of debris, clutter and weeds; this can reduce the airflow of the unit. Use caution with weed trimmers around the unit to prevent damaging control wiring. And lastly, keep pets away from the unit; pet urine can cause expensive damage. A: The most common cause of lost efficiency for a water heater is due to a sediment buildup in your tank. As water heaters grow older, they accumulate sediment and lime deposits. If these deposits are not removed periodically, the sediment will create a barrier between the burner and the water, greatly reducing the water heater’s performance level. The result is an increase in the amount of fuel required to deliver hot water. For this reason, it is recommended that the storage tank in the water heater be drained and flushed free of any sediment every 12 months. This service will bring your water heater back to original manufacturer’s specifications. A: The EnergyGuide label is important when shopping for an energy-efficient product. The U.S. government requires manufacturer’s to affix the label to a variety of products to provide a way for consumers to compare the energy use of similar appliances. The label helps you understand and compare the estimated yearly operating cost based on the unit’s electricity usage and the national average cost of energy. Estimated yearly electricity use tells consumers how much electricity the appliances use in a year based on typical use. Multiply this by the electricity rate on your utility bill, and you can determine your estimated operating costs. The EnergyGuide label makes it easier to find energy efficient appliances, which cost less to run, and help lower your utility bills. And of course, using less energy is good for the environment, too; it can reduce air pollution and help conserve natural resources. Q: What is a good temperature to set my thermostat? A: ime, the best thermostat setting is that temperature at which you feel most comfortable. However, when extremely high summertime temperatures set in, the best temperature setting is going to be 15 to 16 degrees below the outside temperature. Remember, your air conditioner can only produce so much cooling, no matter how low you set the thermostat. And no matter what temperature you choose, once you have found a ‘comfort zone’ leave that thermostat set in one place – turning it up and down constantly only costs you more energy! Q: I hear a rumbling sound coming from the water heater. What could cause this? Q: Allergies and asthma run in my family. How can I improve my indoor air quality? An air purifier whole-house air filtration system is the most effective air cleaning system available. It thoroughly cleans and filters out 99.98% of airborne allergens that pass through the system. It is up to 100 times more effective than a standard 1" filter. Q: I have very cold and very warm rooms in my home. Is there anything I can do? Q: When replacing the outdoor unit, do I need to replace the indoor unit as well? A: The answer is most likely yes, and here are the reasons why. First of all, all air conditioner and heat pump outdoor units are specifically designed to work with matched indoor units for optimum efficiency and performance. The result of this matched system is a coordinated, top-performance team that ensures dependability and efficiency. Air conditioner and heat pump outdoor units may "work" with indoor units other than those for which they have been specifically designed; however, the result is a definite compromise in system performance. In addition, through the years, indoor blower coil units have undergone numerous design advances — especially in the areas of air handling performance, filtering efficiency and operating sound levels. A new outdoor unit will also include the latest design advances. The cooling and/or heating efficiency ratings that are advertised for an air conditioner or heat pump are based on their performance as matched systems. While changing only the outdoor unit may result in improved efficiency compared to the old system, it will not be as efficient as it was designed to be and your savings will be lower than with a matched system. If an air conditioner or heat pump outdoor unit is 10 years old and needs to be replaced, the indoor unit is just as old and has been subjected to the same amount of wear and tear. Replacing both units means you won't have to replace the indoor unit in a short time...you'll have years of service from both units. Last, but not least, a new unit also gives you a new product warranty. Replacing the indoor unit at the same time as the outdoor unit results in peace of mind, knowing the new warranty covers your entire system. At first glance, replacing only an air conditioner or heat pump outdoor unit may appear to be a bargain. But when you consider the lower cooling and heating efficiencies, decreased reliability and high cost of ownership that results, it's not such a bargain. Replacing an entire system costs more, but you get more efficiency, reliability and comfort. Q: Do I really need to have my air ducts professionally cleaned? Q: How long should my furnace last? A: This depends greatly upon how well it is maintained but in general the average life is 15 years. But I can’t stress enough that the better maintained your furnace is, by having seasonal check-ups performed every fall, the longer you can expect it to last. My rule of thumb is when your system is around 10 years old and repair costs are getting high you should start looking into replacement. Another major tell is if your heat exchanger, the area that harnesses your fire in the furnace, shows rust and deteriation. In this instance you should definitely consider replacement. Heat exchangers that crack will leak carbon monoxide, a by-product of gas being burned off. This colorless, odorless gas will enter your home and is deadly to you and your family. Q: Can I troubleshoot my HVAC system before I call in for a repair? A: Of course you can! Air Specialist’s heating and air conditioning specialists encourage you to perform these simple procedures before calling us. Check disconnected switches (indoors and outdoors if you have a split system). Make sure that circuit breakers are on or that fuses have not blown. Check the settings on your thermostat. If you want cooling, make sure the temperature control selector is set below room temperature and the SYSTEM switch is on the COOL or AUTO position. If you want heat, make sure the temperature control selector is set above room temperature and the SYSTEM switch is at HEAT or AUTO. The FAN switch should be set at ON for continuous blower operation or AUTO if you want the blower to function only while the home heating system or central air conditioning unit is operating. Q: Our home is so dry and uncomfortable in the winter. Is there anything we can do? A: Our customers’ overall safety and comfort in their home is always our top priority. The #1 reason why people get colds and flu in the winter is due to the lack of humidity in the air. When the temperature drops in the fall and winter it is important to keep a home properly humidified. Adding a whole-house humidifier will eliminate dry, scratchy throats in the winter as well as protect a home’s walls and furniture from the cracks and damage that dry air causes. In addition to a standard whole-house humidifier we offer steam humidifiers that do not need the furnace to be running in order for it to humidify the air. A: Suffering from allergies or asthma can have a negative effect on the quality of a person’s life. That is why this issue is another concern that our customers express when they call into our office. The dust & pollutants that are trapped in homes are troublesome for everyone but particularly for those who have allergies and asthma. We provide our customers with several options of air filtration systems to address these concerns –– Honeywell Electronic Air Cleaner and Honeywell Media Filtration Systems. Our technicians can evaluate your particular situation and find the best solution for you and your family. Q: What can I do in my home to insure cleaner, safer air for my family to breathe? A: This is the time of year when homeowners become most concerned with their family’s health. In recent years there has been a strong emphasis on conserving energy and therefore, homes are sealed tighter in order to prevent air from escaping. As a result, fresh air is unable to come in and indoor air contaminants become trapped inside causing poor indoor air quality. Many of the questions that come in to our office are from people who want to know how to improve the quality of air inside their homes making it safer for their families to breathe. The recent Swine Flu pandemic has people even more concerned. A simple solution to improving the air people breathe at home is the easily installed Guardian Air PHI Cell. The HVAC-PHI Cell is easily mounted into air conditioning & heating system air ducts where most sick building problems start. Not only is it proven to kill 99% of swine influenza virus, but it also uses Photohydroionizaton (PHI) technology to rid homes of other harmful pollutants that cause disease and illness. It is a product that Air Specialist has a lot of confidence in and has been approved by the USDA, FDA and FSIS. In addition to killing swine flu it also rids homes of gasses & odors up to 85% and microbial bacteria up to 99%, it reduces e coli, listeria, strep and bird influenza by 99%, kills SARS, Candida, Norwalk, MRSA and Bacillius spores, reduces airborne mold by 97% and causes a 99% food surface microbial reduction. Q: I have friends and relatives that have installed UV lights on their furnace. What are they for? A: UV is the abbreviation for ultraviolet. Located in the return air ductwork and by the indoor cooling coil, the ultraviolet air treatment system continuously emits high – intensity ultraviolet (UV) energy. The energy eliminates (kills) a very high percentage of airborne bacteria and germs passing over the UV light field inside the ductwork. The UV light mounted next to the indoor cooling coil will help eliminate the growth of mold, mildew and other contaminates from the drain pan and coil surface. At Air Specialisti we recommend installing non-ozone-producing UV products. Q: Should I be concerned about carbon monoxide? A: Carbon monoxide, also known as the silent killer, can pose a serious threat in some instances and is yet another reason to have your furnace and water heater inspected by Ari. A carbon monoxide detector is a wise investment. Air Specialist offers a high quality carbon monoxide detector that has a 5-year warranty. Q: What’s that black stuff on my ceilings and vents? A: Burning candles can be the culprit for the black on your walls and ceilings as well as polluting the air your family breathes. Keep wicks trimmed to no longer than 1/4th of an inch to help reduce soot from the candles. Q: Should I get my ducts cleaned? A: Cleaning your ducts may be beneficial in improving your indoor air quality. A premium whole house duct cleaning will help decrease the spread of contaminates in your ductwork and home. New construction homes can benefit from having the ductwork cleaned to remove drywall dust, sawdust and other debris from the construction process. Q: My furnace and air conditioner are both new, do I really need to have it cleaned? A: Yes!! Even though your system is new, it still needs to have annual maintenance performed. This will help keep the warranty in effect. Most all equipment manufactures state in the terms of their warranty that annual maintenance must be performed by a qualified technician. Keeping your system maintained will give you assurance that it is operating at peak efficiency and safety. Q: During the winter the fan occasionally shuts off on my heat pump outside unit, then restarts. Why? A: Nothing is wrong with your unit. What appears to be smoke is steam from the outdoor coil after it completes a defrost cycle. After extended run times the outdoor unit will start to build frost or ice on the coil. The system is designed to go in a defrost mode when needed to clear the ice away and keep the efficiency level up. Q: Why is the upstairs of my house always hotter in the summer & cooler in the winter? A: Heat rises, thus the reason it’s hotter in the summer. Assuming the system was sized and installed correctly, you should consider installing a zone system if possible. Sometimes the addition of return air ductwork will help improve air movement and help make upper levels more comfortable. Q: What kind of maintenance can be done manually? A: With the proper maintenance and care, your equipment will operate economically and dependably. Though the professionals at Air Specialist are there to help with your heating and air conditioning unit, there are a few simple, routine maintenance operations you can do to help ensure the best performance and comfort from your heating and air conditioning system. Safety First Before you perform any kind of maintenance, consider these important safety precautions. Although our manufacturers take special care to prevent sharp edges in the construction of heating and air conditioning equipment and indoor air quality systems, it’s best to be very careful when you handle parts or reach into units. Do-It-Yourself Heating and Air Conditioning Maintenance Check the air filter in your furnace or fan coil every three to four weeks. A dirty filter will cause excessive strain on your furnace, air conditioner or heat pump. Replace your filter when necessary or clean it if you have the reusable type. (If you have a reusable filter, make sure it’s completely dry before you re-install it.) The pre-filter and collection cells of an electronic air cleaner should be cleaned at least two or three times per year for optimal indoor air quality. Clean dust off of your indoor coil. With a vacuum cleaner and soft-brush attachment, you can remove any dust from the top and underside of the coil. Make sure you only do this when the coil is dry. If you can’t get the coil clean this way, call us for service. Keep your outdoor condensing unit free of debris. If you keep grass clippings, leaves, shrubbery and debris away from your outdoor unit, it should only require minimal care to operate properly. Check the base pan (under the unit) occasionally and remove debris, to help the unit drain correctly. If the outdoor coil becomes dirty, use a brush or a vacuum cleaner with a soft brush attachment to clean the surface. To clean dirt that is deep in the coil, contact us. Take special care of outdoor condensing units in ocean environments. Living in Monmouth and Ocean counties, many Jersey Shore residents can help preserve their heating and air conditioning system with some extra care. Ocean mist and sea breezes carry salt, which is corrosive to most metals. Although new furnaces and air conditioner units are made out of galvanized metal and are protected by top-grade paint, you can add life to your unit by washing all exposed surfaces and the coil approximately every three months. (Ask your installing contractor about the appropriate interval in your area.) Make sure your outdoor unit stays in a level position. If the support for your split-system outdoor unit shifts or settles and the unit is no longer level, re-level it promptly to make sure moisture drains properly out of the unit. If you notice that water or ice collects beneath the unit, arrange for it to be drained away from the equipment. Inspect your furnace’s combustion area and vent system before each heating season. If you find dirt, soot or rust, your system may not operate properly or at its peak efficiency. Call us and do not operate your furnace until it is professionally inspected and/or repaired. Have oil-fired boilers inspected annually. Contact us before each heating season to replace your oil filter cartridge and conduct a thorough inspection of the unit’s operation. This will make your home heating system work at peak efficiency. Clean your humidifier at the beginning of every heating season. Review your owner’s manual for the proper procedure to clean the external and internal components of your whole house humidifier. The evaporator pad should also be replaced before each heating season. If the water in your area is hard or has high mineral content, you may need to clean or service your humidifier more frequently. Clean the core and air filters on a ventilator at least every three months. You can vacuum the core of an energy recovery ventilator as long as it is dry and the outdoor temperature is between 60 F (16 C) and 75 F (24 C). Heat recovery ventilator cores can be soaked for three hours in a solution of warm water and mild soap and then rinsed. Ventilator air filters are washable: just use a vacuum to remove the heaviest accumulation of dust and then wash them in lukewarm water. Replace them after they are completely dry. Q: What system is best for my home and my budget? A: To determine which home heating and air conditioning system is best for you, take into consideration factors such as: your budget, your comfort expectations, physical factors (such as your current system) and other unique features of your home. Because your geographical region is also an integral factor in choosing a home heating system or home central air conditioning unit, that should be taken into consideration as well. Everybody's home is different. Some are big, some are small. Older homes are not as tightly sealed as new ones, which means efficiency is reduced. The number and size of windows, what direction the home is facing, number of mature trees in the yard and many more factors can affect your comfort, and may play a part in deciding what type of system is best for you. An Air Specialist specialist has the expertise to assess any unusual circumstances surrounding the specific needs of your home. Q: How can I save money on a heating or air conditioning system? A: Will the lowest priced heating and air conditioning system end up costing you money in the long run with high operating costs or by needing to be replaced sooner? Will the lowest priced system provide the comfort you expect? Before you make your final decision, you should consider operating costs and efficiency ratings. The government mandated a minimum AFUE rating for furnaces installed in new homes is 78%. (In contrast, many furnaces manufactured before 1992 had AFUE ratings as low as 60% — so nearly half the fuel was being wasted.) Furnaces with AFUE ratings of 78% to 80% are considered "mid-efficiency"; those with ratings of 90% or higher are known as "high efficiency." The maximum furnace efficiency available is around 96.6%. If you live in a cold climate, you could see a payback in a few short years. If you live in a moderate climate, it might make more sense to purchase a mid-efficiency furnace. An Air Specialist representative can use heating system data from your area to help you determine about how long it would take you to recover the additional cost of a high-efficiency model in energy savings. And after the payback, you continue to save on your energy bills for the life of the system. Higher efficiency in heat pumps and air conditioners usually means higher cost but lower utility bills. If you live in a warm and/or humid climate, you will probably see the higher cost of a high-efficiency air conditioner or heat pump paid back (through lower utility bills) in a few short years. Ask an Air Specialist representative to help you determine about how long it would take you to recover the additional cost in energy savings. Of course, after the payback, you continue to save on your energy bills. There’s one other factor that affects the efficiency of your air conditioning or heat pump system: the indoor coil. (Your heat pump or air conditioner is a "split system" which means that there is an outdoor unit or condenser and an indoor unit or evaporator coil.) If your condensing unit is not matched with the proper indoor coil, it may not give you the stated SEER and/or HSPF ratings and could even develop performance problems. When you’re replacing an existing home heating and air conditioning system, make sure you replace both units so your new condensing unit will give you optimal performance, efficiency and comfort. Choosing to purchase a furnace in the 90-96% efficiency range can reduce pollution and save homeowners hundreds of dollars over the equipment's lifetime. Industry-leading furnace manufacturers have signed agreements with U.S. Environmental Protection Agency to produce and promote high-efficiency furnaces that are 90% efficient or greater. These high-efficiency gas furnaces squeeze energy savings from furnaces using an advanced "condensing" technology. Products qualifying for this U.S. Environmental Protection Agency program will be identified by the U.S. Environmental Protection Agency Energy Star logo. By increasing the efficiency of new heat pump and air conditioning units being installed, we can dramatically reduce the nation's energy consumption and resultant pollution. This will also help utilities offset their peak loads and avoid having to construct costly new power plants. More efficient equipment has the added benefit of helping consumers save money on their energy bills. Q: What should I look for in a home comfort system? A: It is best to evaluate what makes your home comfortable to determine what heating and air conditioning system is best for your home. Heating and cooling are the foundation for your system but you have a lot of flexibility to maintain comfortable temperature, air cleanliness and humidity levels. Matching Your heating and air conditioning system for Optimum Efficiency. There’s one other factor that affects the efficiency of your air conditioning or heat pump system: the indoor coil. (Your heat pump or air conditioner is a "split system," which means that there is an outdoor unit or condenser and an indoor unit or evaporator coil.) If your condensing unit is not matched with the proper indoor coil, it may not give you the stated SEER and/or HSPF ratings and could even develop performance problems. When you’re replacing an existing home heating and air conditioning system, make sure you replace both units so your new condensing unit will give you optimal performance, efficiency and comfort. Q: How do I get my toilet tank to stop overflowing? A: Probably the fill valve in the tank has a leak in it. If the fill valve is old, you should replace it. Sometimes the shaft or wire that is used to set the level corrodes off. If the shaft or wire seems to be your problem then by replacing this you should fix your problem. Another possibility, if the fill valve has been replaced recently, is that it could be set too high. Q: Why doesn’t water enter the bowl when I try to flush my toilet? A: Make sure the water supply is turned on. If it is, remove the lid to the toilet tank. It is probably the chain or strap to the flapper that is broken or come loose. You could also have a blockage in the toilet “jet’s” just under the rim of the toilet. Q: Why does my basement toilet “sweat” is there anything I can do to prevent this? A: This is caused by cold water filling the tank and humid air in the bathroom. This can cause condensation to form on the outside of the tank. There are a few of things you can do. You can insulate the inside of your tank. They sell kits for this and they work fairly well. The tank covers you can put on the outside help somewhat as well. You can also get a mixing valve. This is put on your cold water supply. It will add just enough hot water to the cold to warm it up. When the tank is filled with water at room temperature it won’t sweat. Q: My toilet is always running. Is there anything I can do myself to fix this? A: It is most likely the flapper in the bottom of the tank, which you can simply replace. Sometimes the chain can be too long and get caught under the flapper. The chain should be long enough to reach from the lever arm to the top of the flapper without pulling on it. Q: Why do I have hot water in my toilet? A: You may have hot water in your toilet because of a bad flapper in the toilet tank or a bad fill valve. When a toilet has a mixing valve (to prevent condensation), a little hot water is added to bring the temperature up. When this system is not functioning correctly, you can get a bowl full of hot water!